Certified Public Accountants (CPAs) are a common target for cybercriminals. Throughout 2012, we intercepted several campaigns directly targeting CPAs in an attempt to trick them into clicking on the malicious links found in the emails. Once they click on any of the links, they’re automatically exposed to the client-side exploits served by the latest version of the Black Hole Exploit Kit. In this post, I’ll analyze one of the most recently spamvertised campaigns impersonating the American Institute of Certified Public Accountants, also known as AICPA. 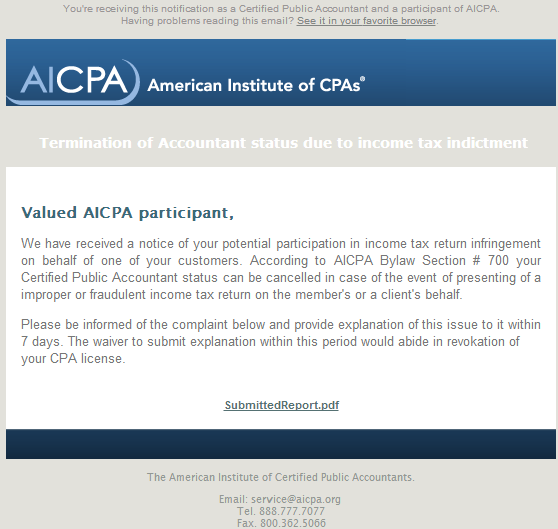 Email message: Valued AICPA participant, We have received a notice of your potential participation in income tax return infringement on behalf of one of your customers. According to AICPA Bylaw Section # 700 your Certified Public Accountant status can be cancelled in case of the event of presenting of a improper or fraudulent income tax return on the member’s or a client’s behalf. Please be informed of the complaint below and provide explanation of this issue to it within 7 days. 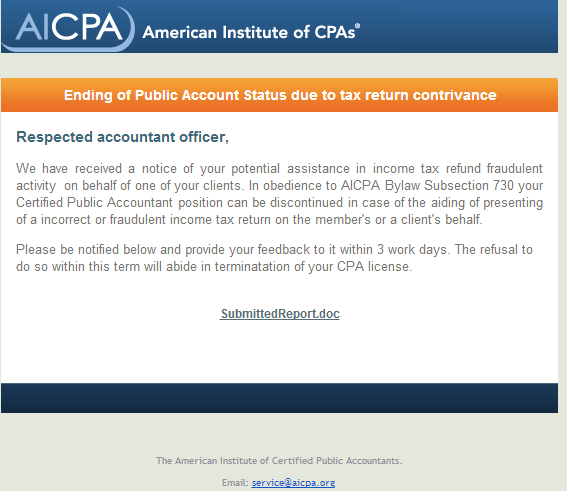 The waiver to submit explanation within this period would abide in revokation of your CPA license. Upon successful client-side exploitation, the campaign drops MD5: 5b7aafd9ab99aa2ec0e879a24610844a – detected by 31 out of 45 antivirus scanners as Worm:Win32/Cridex.E. It also drops the following MD5 on the affected hosts: MD5: 3e2df81077283e5c9d457bf688779773 – detected by 27 out of 45 antivirus scanners as PWS:Win32/Fareit. We’ve already seen the same name servers (NS1.AMISHSHOPPE.NET; NS2.AMISHSHOPPE.NET) used in the following previously profiled campaigns, indicating that all of these campaigns have been launched by the same malicious party.